Arsenal Note: We have the utmost respect for Alemu Beeftu. He is a true apostolic leader who is raising up leaders overseas and within the United States. He is definitely one of the leaders we hold in high esteem because he is out doing the stuff of discipline and raising up new leaders to take the gospel to the nations. Throughout Scripture, we see many examples of God asking questions of His people. God still does this today, and understanding why He questions us is vital to being effective in our personal lives and in fulfilling our leadership roles. God asks us questions for our sakes, not because He does not know the answer. He challenges us to seek the answers that will bring about the revelation and transformation we need to fulfill our destiny in Christ. In our encounter with Him, we come to know His nature and will more intimately. Ultimately, God’s questions enable us to move from ordinary leadership to extraordinary relationship with Him. In the following chapters, we will study 14 questions posed by God or His agents to bring about strategic and sometimes radical changes in the lives of certain men and women in the Scripture. As you read about these examples, I pray you will be led to answer each of these questions in your own life for the benefit of your personal revelation and transformation. Chapter 1: Will You Give Me a Drink? Chapter 2: Why Do You Cry? Chapter 3: Why Do You Persecute Me? Chapter 4: Where are You? Chapter 5: Where Is Your Spouse? Chapter 6: Where Is Your Brother? Chapter 7: What Is Your Name? Chapter 8: Who Are You? Chapter 9: What Is the Sound I Hear? Chapter 11: What Do You See? Chapter 12: What Is In Your Hand? Chapter 13: What Are You Doing In the Cave? Chapter 14: How Long Will You Mourn For Saul? Most often when God encountered a leader with a question, He invited that leader to reflect on a deeper issue, which ended up in a significantly growing knowledge of God and deeper intimacy with Him. Alemu Beeftu writes from his own experience and through the unique way God has revealed His words to him. I highly recommend this book for those who want to explore the effectiveness of Reflective Leadership. Do you want to know God’s heart and His divine will for you along the path of your journey with Him? Then pay deep attention to the questions that He asks along the way. 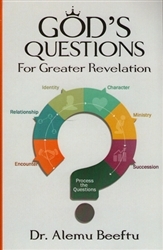 These questions will undoubtedly take you to a deeper level of understanding and draw you closer to God. My dear friend, Alemu Beeftu, unpacks a number of questions from Scripture and models for us how God does indeed ask questions of us, if reflected on, will take us to a deeper level of understanding. God’s Questions for Greater Revelation is like a roadmap for those of us who desire to draw deep from Scripture and live out our calling with great joy. I highly recommend it. Dr. Alemu Beeftu is the founder and president of Gospel of Glory. He has a B.A. from Biola University, a Master’s and a Doctoral degree in Curriculum Design and Community Development from Michigan State University. More than 30 years of practice in these and related fields have made him an accomplished and sought-after leadership trainer in over 40 countries. He has authored several books and continues to equip Christian leaders, mentor emerging young leaders and empower the Body of Christ worldwide for Kingdom work.